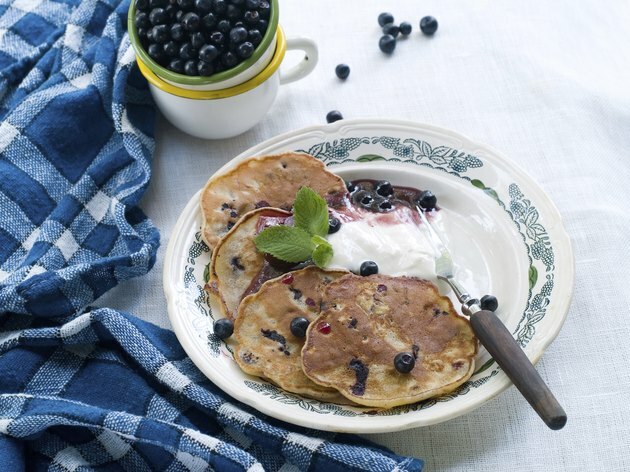 Whether fresh or frozen, blueberries are an attractive, flavorful and healthy addition to pancakes. An average plate of blueberry pancakes with syrup has about 350 calories. Three blueberry pancakes with a diameter of 4 in. have about 250 calories, according to the U.S. Department of Agriculture's National Nutrient Database. Two tbsp. of real maple syrup adds another 100 calories. Three 4-in. blueberry pancakes have 10 g of total fat, of which 2 g is saturated. For someone on a 2,000-calorie diet, that's 15 percent of the recommended daily value of total fat and 10 percent of saturated fat. Pancakes also provide 7 g of protein and 33 g of carbohydrate. Try to include 1/2 cup of blueberries inside or outside your pancakes. With only 40 calories, each 1/2 cup has 10 percent of your recommended daily value of vitamin C and 7 percent of your recommended daily value of dietary fiber, according to the Centers for Disease Control and Prevention.